Want to be hired by Rita? 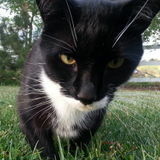 FELIX IS A BLACK AND WHITE SHORTHAIR CAT WHO WAS RESCUED, HENCE HE IS A BIT SHY IN THE BEGINNING. BUT WARMS UP VERY EASY TO PEOPLE WHO LIKE ANIMALS.